For at least a decade, the dominant idea about how to improve outcomes for children and youth has focused on control and compliance; holding adults accountable for raising test scores. This approach has proved least effective for our most vulnerable students. In our search for silver bullets, reformers and policymakers alike have overlooked strategies that have long shown promise and for which there is mounting evidence of success. Community schools is one of these strategies. This report was prepared by the Center for Popular Democracy. It was written by Evie Frankl and edited by and with research assistance from Katherine Dunn, Mary Kingston Roche, Kyle Serrette, and Connie Razza. The report uses a framework adapted from the Alliance to Reclaim Our Schools (AROS). Community schools combine challenging and culturally relevant learning opportunities with the academic and social supports each and every child needs to reach their potential. These schools, at their core, are about investing in children, through quality teaching, challenging and engaging curricula, wrap around supports, positive school climate, strong ties to family and community and a clear focus on results. It’s clear the tide is turning, as interest in this vision of schooling is now evident in the nation’s major education policy, the Every Student Succeeds Act (ESSA). We note in particular the inclusion of factors in accountability systems that extend beyond test scores, as well as provisions for the use of resources to strengthen school-community partnerships—including needs assessments, teacher development on family/community engagement, and support for personalized learning—reflective of the community schools strategy. This report profiles community schools across the country, all which demonstrate consistent improvement in a wide range of indicators of student success. The best of these schools leave nothing to chance. They are as committed to challenging academics as they are to health, wellness and social and emotional learning. They are sustained by the broad support they enjoy from their communities. And they represent the ultimate purpose of our schools: to prepare young people to pursue their aspirations and participate fully in our economy and democracy. This report intends to shed light on how community schools come alive in practice, and the improvements in academic and social outcomes that emerge when these schools are given a chance to work. There are over 90 communities across the country with significant efforts underway. In low income communities and communities of color, we have not always valued the power of citizen input and the capacities within communities to coalesce around their children. This needs to change. When communities are excluded from our improvement strategies they are not likely to be sustained and children lose. School climate suffers, chronic absenteeism persists, discipline problems push students out of school and learning outcomes suffer. 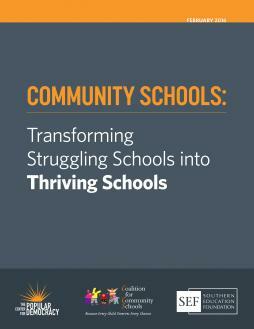 We hope you will take to heart the lessons from community schools across the country that we profile in this report. If we are to create truly transformative learning opportunities for children and youth, especially the least advantaged, we need to examine closely the strategies this report highlights. We owe our young much more than a basic education. We owe them a genuine opportunity to determine for themselves how they will work and live in this great country.